Brea Mayor Christine Marick: Tell Sister City Anseong (Gyeonggi-do), South Korea, That We’re Opposed to the Torture and Consumption of Dogs and Cats. Brea, California became Sister city to South Korea’s Anseong (Gyeonggi-do) in 2011. Yet Anseong, South Korea is responsible for the ongoing horrendous torture and killing of dogs and cats. Anseong is one of the largest dog meat consumption areas in South Korea. If you have ever wondered what hell would be like, just visit or watch the videos of dog farms and slaughterhouses scattered all throughout Anseong. There are countless dog farms from small to very large, markets and restaurants where the dogs, who are tortured their entire lives, end up being slaughtered in the most inhumane ways, such as by electrocution, hanging or beating; and then thrown into boiling water – sometimes while they are still alive. In many places, dogs are being killed in full view of other terrified, caged dogs; and this takes place in public and in broad daylight. In addition, many abandoned and stolen former pets end up in this industry, and are subjected to the same cruelty. A Search Engine reveals the sickening scale of Anseong’s dog meat demand. 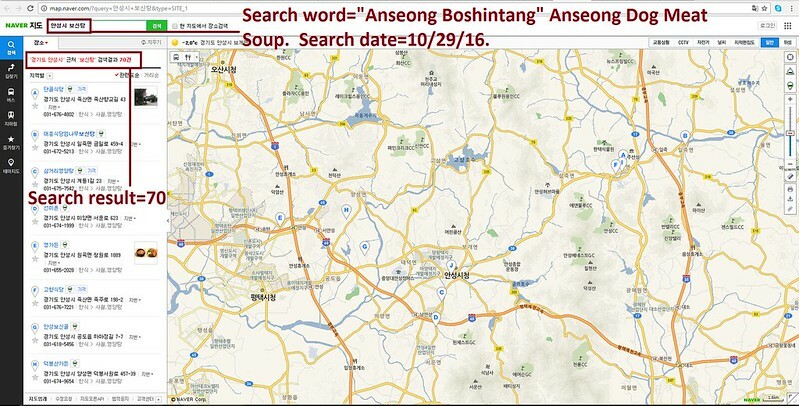 The searches resulted in: 124 Health Food Centers; and 70 restaurants in and around the city of Anseong alone. 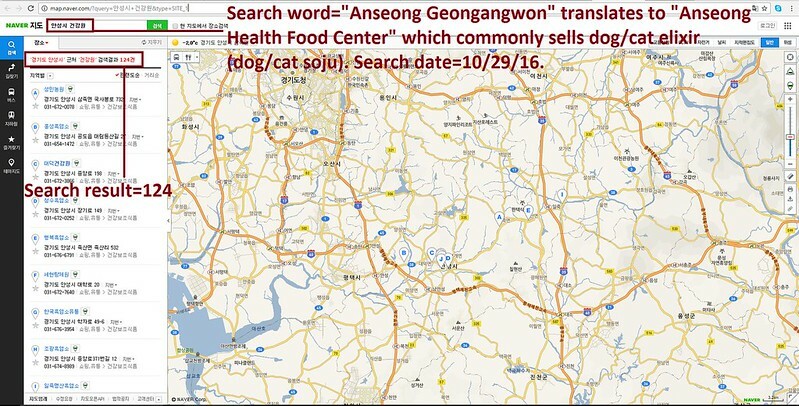 Even if half of these ‘Health’ Food Centers and restaurants serve dog and cat ‘ingredients’ in one form or another, just imagine how many dog/cat slaughterhouses must be present in and around Anseong in order to supply all of these outlets. Please sign petition, call and email Brea Mayor Christine Marick TODAY! Send a copy of your letter to the Anseong Mayor Eun-Seong Hwang! Anseong is one of the largest dog meat consumption areas in South Korea. The Korean internet searches resulted in: 124 Health Food Centers which commonly sell dog/cat elixirs (also known as dog soju and cat soju); and 70 dog meat soup restaurants in and around the city of Anseong alone. No matter where you live PLEASE SHARE these actions with your friends – especially those who live in Brea! I received an email from her and yes, she did receive a whitewashed version of what is really happening. I also expressed to her how many people have been made aware of the atrocities there and she aid that they will continue to monitor it. I responded with an email that pasaid how many animals have suffered and the third world mentality those people have, to not believe their lies. I pointed out that they did lie, saying it was illegal and they do not allow for it to happen, to check out the videos and pics, not to mention the testimonials of those in the trenches who are fighting every day, facing the horrors. I also pointed out that they will lie to absolve themselves because they are not the ones who are actually participating in the dog/cat culls … but that doesn’t mean they aren’t enjoying it. Disgusting. I attached a comment to yours because I do not have FB, but it makes me sad for the animals and happy that there are so many, worldwide, that care enough to keep up the fight even if there seems to be no end in sight. Hearing about the closures makes me know that I am participating in something that is truly worthwhile. Thank you for letting me post onto yours, but I wanted to let KOREANDOGS know that I did send an email and I do sign the petitions, even going so far as to write an email to President Obama. I’ve send the letters to the e-mails. host ci.brea.ca.us [207.213.88.195]: 550 Sender IP reverse lookup rejected. This is too horrendous to watch or even read. I am well aware of what these precious beings are put through and beg for it to stop immediately. The choice of food at the disposition to humans is wide ranging and varied, this practice of eating dogs and cats is unthinkable and the barbaric way in which the killings are carried out is unspeakable and sickening, not to mention the way in which they are treated until the final blow is delivered. Please stop this and move with the rest of the world. Many Sout Koreans are against this practice but until they remain a minority their voices remain unheard. Now we have to deal with the city of Brea, what’s wrong with people, where have their souls disappeared to? This is so sick and you take the hell of your stuff out of society! No samsung, gl or whatever. YOU DO NOT MAKE BUSINESS WITH THE INNOCENT! I can’t watch the videos it makes me so sick…are these people even human? I have sent the letters to the emails, this is so sad and, heartbreaking. I AM one of Koreans who are against dogmeat consumption and any related industry. My ancestors never agreed to this horrible malpractice. You really should look into your logic when you say dogmeat eating is part of Korean tradition. No way. Something that only part of people did from ignorance and savage can’t be accepted as tradition like Kimchi. Please be aware that this has to end for human. Any cruelty should be criticised and punished. WHY ARE OUR TROOPS DEFENDING THESE SAVAGE Mutilators, Torturers, and goddamn KILLERS OF OUR BELOVED COMPANION ANIMALS (DOGS)? They are despicable Savage Motherf_____G SAVAGES who should all be rounded up and thrown into boiling pots – just what these savage bastards do to our beloved Dogs. They are INSENSITIVE DOG KILLING MACHINES. HANG EVERY ONE OF THESE SOUTH KOREAN SAVAGES. Moreover, this is a problem which is prevalent throughout Southeast Asia. Korea, please stop the killing and consumption of dogs and cats. This is NOT Korean’s tradition. Hanbok, Kimchi, Gayageum, new year.. this is tradition. In the name of fake “tradition”, you are allowing illegal killing of our fellow companion and loyal animals in such a barbaric and horrendous way right in our back alleys. Why are you allowing these butchers to profit off of blood and continue? We are in the 20th century. We have noraebangs, kpop, kdrama, universities, samsung, LG. SOJU which surveyed #1 liquor… Korea seems to be prospering.. why are you turning a blind eye to the electrocution, boiling, skinning alive of these creatures that feel, think, love human beings?? Please stop. These dogs are suffering because you allow it. These butchers should not be allowed to breed them for food. Korea, you need to push for laws that enforce this. Currently, it seems like anyone can open a dog meat restaurant. Just breed two dogs and you have an unlimited amount of meat. No third party needed. Spread superstition that dog meat does a body good. How foolish. How primitive. How devastating. BASTA YA CON ESE MALDITO Y CRUEL FESTIVAL DE GENTE ASESINA E IGNORANTES!!!!!!! !